On March 4, Romania, Azerbaijan, Georgia and Turkmenistan held a ministerial meeting in Bucharest—the first such quadripartite gathering for these governments. During this meeting of their foreign ministers, the parties issued a joint statement reaffirming mutual respect for each other’s sovereignty, territorial integrity and inviolability of their internationally recognized borders (Mfa.gov.az, March 3). Additionally, a number of other important issues were raised in Bucharest, including a discussion on establishing a multimodal corridor for the transport of goods between the Black Sea and Caspian Sea basins, a project officially named the Caspian Sea–Black Sea International Transport Corridor (ITC-CSBS). The newly proposed route will connect to the Trans-Caspian and Lapis Lazuli corridors, already under development (see EDM, November 27, 2017; November 30, 2017), which link Afghanistan with Turkmenistan, Azerbaijan, Georgia and Turkey. Reportedly, Romania and Turkmenistan were the main initiators of the ITC-CSBS project, as these countries are keen to create trans-border passage for maritime, river, road and rail freight traveling between Central and Northern Europe and the South Caucasus and Central Asia (Ports Europe, March 6, 2019). In October 2018, working groups from Turkmenistan and Romania held an official meeting in Ashgabat in order to approve the main route for this transit. Perhaps most interestingly, the negotiations also included officials from the European Union, thus underlining the strategic importance of this project for the West (Trend, July 24, 2018). Goods traveling via the ITC-CSBS will be transported via ferry from the Turkmenistani port of Turkmenbashi to Azerbaijan; from there, it will be moved onto rail cars and carried by train to Batumi or Poti (Georgia), before again boarding ships, to cross the Black Sea to Romania (the port of Constanta). For now, it is unclear what other countries might be interested in this new transit route for their trade. But India and China seem like the most likely partners. Importantly, last month’s adopted quadripartite statement on the ITC-CSBS contains four technical annexes regarding maritime navigation, road transport, railway transport as well as customs procedures—thus pointing to the seriousness of the participating countries in moving forward with this project (Ports Europe, March 6). A broad confluence of national interests have brought the four project participants together to back the Caspian–Black Sea corridor. For instance, Turkmenistan is looking to this and other trans-regional transit corridors as outlets to reach potential new markets for its goods, in particular liquefied natural gas (LNG). The export of LNG to Europe via the port of Constanta, in Romania, would bring Turkmenistan important benefits, particularly as it seeks to diversify its end customers and export routes (see EDM, February 25). That said, the transport of LNG by ferry and rail, across the two seas, will significantly increase its cost to European consumers (Ports Europe, March 6). 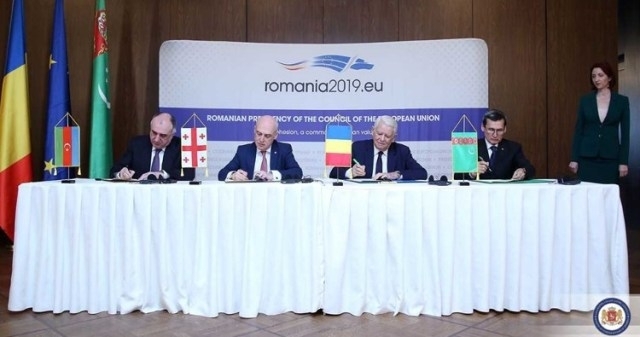 In turn, Romania is keen to turn its Black Sea port of Constanta into a key hub for the shipment of goods from Asia to the EU as well as for European exports to the wider Black Sea and Caspian basin. Additionally, some experts claim that the new route could be used for the transportation of cargo by the North Atlantic Treaty Organization (NATO). The route will link Romania—a NATO member country—with Afghanistan, where North Atlantic Alliance forces remain actively engaged. As such, the potential strategic importance of the ITC-CSBS for Romania and other transit countries—including Georgia, which also has troops stationed in Afghanistan—becomes quite clear (Vestnik Kavkaza, October 28, 2018). Azerbaijani authorities also expressed enthusiasm in signing last month’s four-party agreement on the new transit route. Notably, thanks to the development of this corridor, Romania will become a new gateway to the EU market for Baku. “The outcome of the “Caspian Sea–Black Sea International Transport Route […] can contribute to further promotion of cooperation among our countries and other interested parties in the field of transport, transit and logistics,” Foreign Minister Elmar Mammadyarov declared during the inauguration ceremony (Trend, March 4). Azerbaijan has long been pushing for multiple trans-border projects to enhance the region’s transit potential by promoting various East–West, North–South and South–West transport corridors (see EDM, April 18, 2016). And as such, the country is becoming an important transit hub in its own right, not only for global powers like China and Western countries but also for other regional players like Uzbekistan. Indeed, Uzbekistan has itself been seeking greater access to the Black Sea and beyond—including Turkey, the Middle East, North Africa and Europe—via the South Caucasus (see EDM, October 16, 2017). The Caspian–Black Sea transit route promises to ensure smooth and secure access to import and export markets for all participating countries, in particular for Turkmenistan. In this regard, Azerbaijan and Georgia have positioned themselves as reliable and important partners in delivering goods from Asia to Europe via their territory. Therefore, the importance of the South Caucasus region can be expected to continue to grow, inviting more such trans-regional projects in the future.